Guess Who's Coming to Shabbas, a new initiative for congregations and Jewish organizations, camps and Day Schools, began in September, 2012, as a way to honor a longtime member of Temple Sinai in Dresher, PA. The initiative has two goals; to strengthen the synagogue community and to help families create meaningful memories for themselves and their children. Today, synagogues and organizations across the country are adopting the model for one reason: it works. With an initial objective of including the entire congregation within a ten-month period, the first year resulted in an 82% inclusion rate! 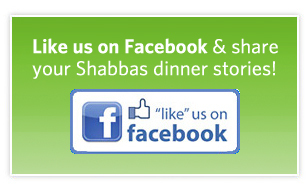 We now invite you to enjoy Shabbas dinner together!